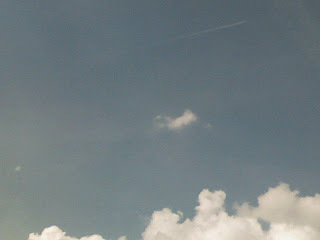 http://skyley.blogspot.com/ for more eyes on the skies! I am sorry that I have not left many comments lately. Whatever is going on with me has me feeling exhausted all the time. I have been just keeping up with my cooking and washing, 14 loads this week. To be fair, one load was sheets and one load was royal towels from His 'Hine'ness' bath. I had to go give more blood at the lab today, she poked my vein and lint came out.............ha! Get this, the Dr. wants to totally rule out mono........now where on earth would I get that......I do not believe it will be that at all. Anyhow, this is why I have been very lean on comments....all I want to do is lie(sp?) down. Don't everyone forget and give up on my site.......just temporary! Happy Skywatch Friday! It is terrible to feel tired all the time! I know all about it. been worried about you, and yes i agree, can't someone help you a bit round the house? you (try) take it easy and rest whenever you can. thank goodness bb is there to take apollo in his truck! sending you cyber cake, red roses and a big KISS. let us know as soon as you know please. 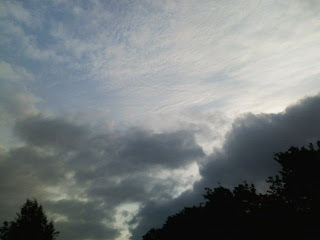 Dramatic SkyWatch shot. I'm sorry to hear you're feeling exhausted. Take it easy on yourself. Mono is a bad word in our house. Years ago my husband was deathly ill. He had no energy and he literally thought he was dying. All sorts of tests were done, CT scans, xrays, bloodwork. But one day an xray tech asked if he was tested for mono and he said no. He talked to his doctor and he said it was unlikely it was mono because it affected mostly young people. Anyway, it WAS mono and it had gone on so long it affected his liver and he got hepatitis. That was a tough year. We fired his doctor! I hope whatever you have is simple to treat and you get better fast. And do ask for help around the house. Be kind to yourself. Whose standards are you trying to live up to anyway? Housework can wait! You take good care of yourself...we do miss you but Health comes first. Don't bother...feel free and calm (I knw it can be difficult at times! )..get a whole of rest, eat nutritious food, drink loads of water and see you bac in full swing. Will be here forever, AU! My liver is a little wonky and they mention it could lead to feeling lethargic and stuff... Have they run blood tests on the liver yet? No worries. I haven't been able to keep up lately myself. You just concentrate on getting better, okay?